An iconic creature from Hayao Miyazaki's legendary animated movie My Neighbor Totoro is the cat bus - a giant, flying cat whose belly is a soft, purring cab for riders. Now Nucleus Gallery is showcasing cat bus inspired art. 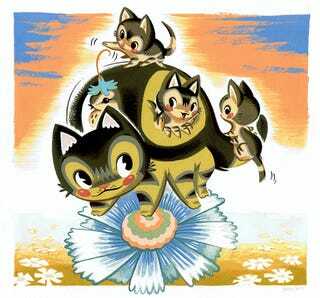 Yes, artist Becky Dreistadt has given us this work, showing a cat bus who has had kittens. And they are face-smooshingly cute. The gallery just launched a blog of art inspired by Miyazaki's Studio Ghibli, which also released classics like Spirited Away, Princess Mononoke, Kiki's Delivery Service, and most recently, Ponyo. The kitten buses are featured on the Nucleus Gallery blog. Have you created any art inspired by Studio Ghibli? You can submit your work to the blog too, and if the curators like it, they'll feature it. Another art blog the Nucleus launched is devoted to ninjas. Here's one of my favorite pieces from that, depicting an extremely upset ninja, by Jon St. Amant. It's called "When The Stress Becomes Too Much." Nucleus Gallery is also a physical space in Alhambra, near Los Angeles. The gallery, which specializes in pop culture art, is currently hosting a show devoted to zombie love. All the images are available online. You can see more amusement from the Nucleus gallery here.